Report on Business SUV and pickup truck sales surge again in U.S.
SUV and pickup truck sales surge again in U.S. 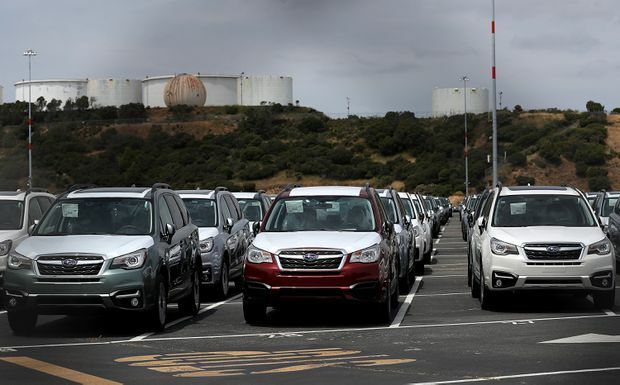 Brand new cars sit in a lot at the Auto Warehousing Company near the Port of Richmond on May 24, 2018 in Richmond, Calif.
Top automakers reported an increase in U.S. auto sales in August including another sharp rise in SUV sales, as low unemployment and strong consumer confidence helped mitigate the impact of rising interest rates and fuel prices. The reports from Ford Motor Co and other top carmakers follow a rise in consumer confidence to a near 18-year high which allayed fears about the impact of President Trump’s protectionist trade policy on sentiment. Ford sold 218,504 vehicles in August, compared with 209,897 a year ago, when Labor Day sales efforts were marred by the arrival of Hurricanes Harvey and Irma. The No. 2 U.S. carmaker said that rise included a 20.1 per cent surge in sales of sport utility vehicles while pickup truck sales rose 5.7 per cent. Ford’s head of US Marketing, Mark LaNeve, said annualized seasonally adjusted U.S. car and light truck sales (SAAR) were between 17.0 million and 17.4 million in August, ahead of the 16.8 million units estimated by analysts polled by Reuters. U.S. auto sales dropped 2 per cent last year from a record 17.55 million in 2016 as consumers shifted away from traditional passenger cars towards larger, more comfortable SUVs and pickup trucks, which are also more profitable for automakers. Ford said earlier this year it would gradually cease production of most passenger cars in the United States. Rival Toyota Motor Corp, which has a larger share of cheaper passenger vehicles, said its U.S. sales had fallen 2 per cent to 223,055 vehicles in August. Its SUV sales rose 8.9 per cent. General Motors, the No. 1 U.S. automaker, no longer reports monthly sales. Industry analysts last week estimated GM sales fell about 8.5 per cent in August. Fiat Chrysler said U.S. sales were up 10 per cent to 193,718 vehicles in August, led by Jeep and Ram. Yet many analysts are forecasting weaker sales for the second half of 2018 and further declines in U.S. vehicle demand next year.